View a sampling of our past work. I've been told by numerous clients that having his and hers baths is how you stay happily married. While I don't know if that is the key to "making it work", I sure did enjoy creating these two unique spaces that reflect the each client's own personality and their lifestyle. 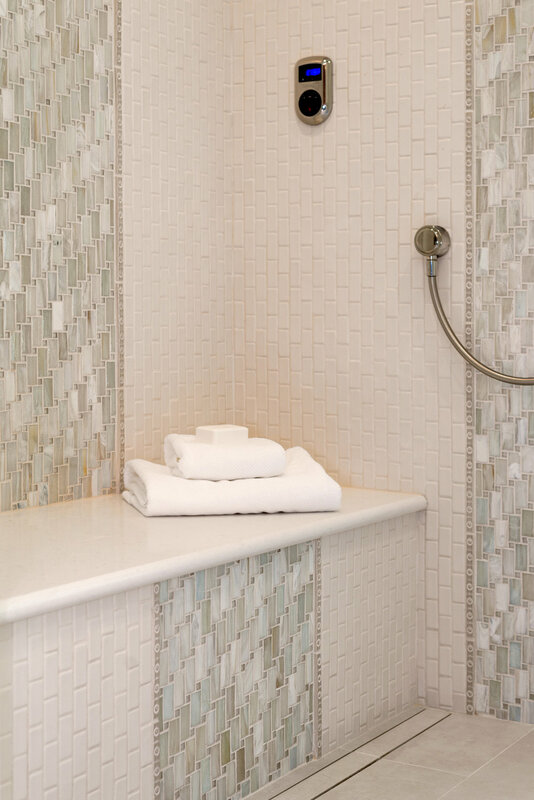 Her's was designed to create the essence of an elegant spa while his bath has a rustic elegance to it. Both spaces are different, but flow with the character of their home. 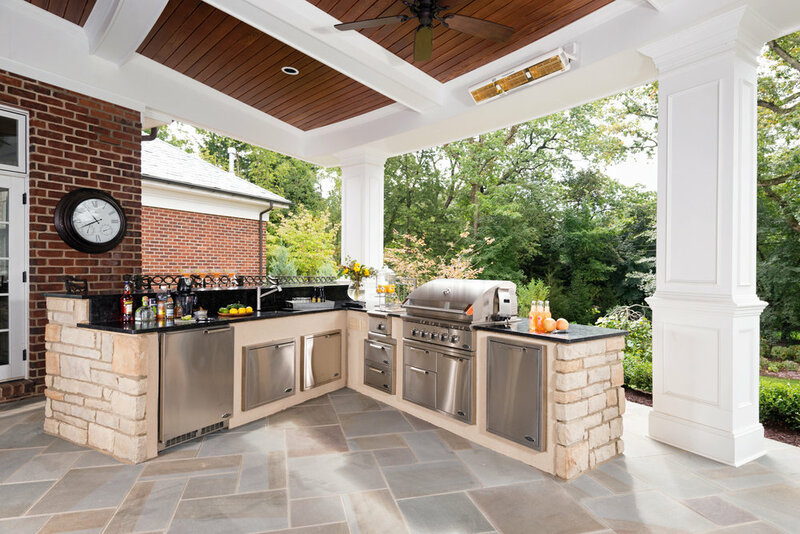 In this job, the client wanted the space to feel like it was an integral part of the radius patio and was unsure how to accomplish this without feeling contrived. To achieve this desired aesthetic, we followed the contour of the radius and created an acute angle on the inside of the L-shape kitchen. Bar level seating was also incorporated with a view of the TV, fireplace, and beautiful backyard. 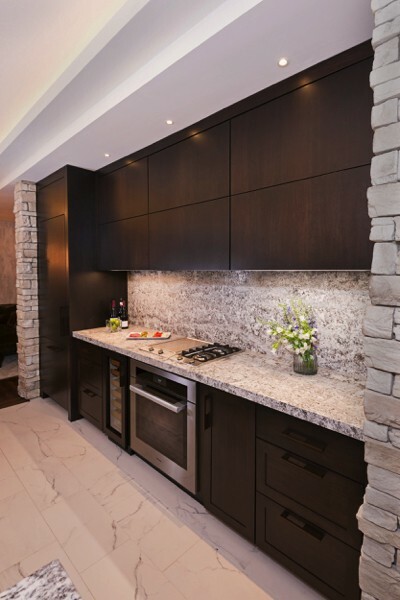 Stainless steel cabinets were set into a stucco facade for durability and ease of maintenance. The existing kitchen was small and not functional for the client and their family. The fireplace was tight to the exterior wall and the space lacked flow. The client wanted a larger island, eat in kitchen, walk-in pantry, dry bar, and office space for mom. By bumping out the exterior wall and using the character of the old space we were able to achieve their dream kitchen design requests. The existing space was confined with no room for an island or home office space. The client wanted a more open floor plan, her own personal office space that could be closed off when entertaining, two islands, and a Butler's pantry. By removing the wall between the family room and existing kitchen we were able to create an open floor plan and help them achieve their dream kitchen design requests. 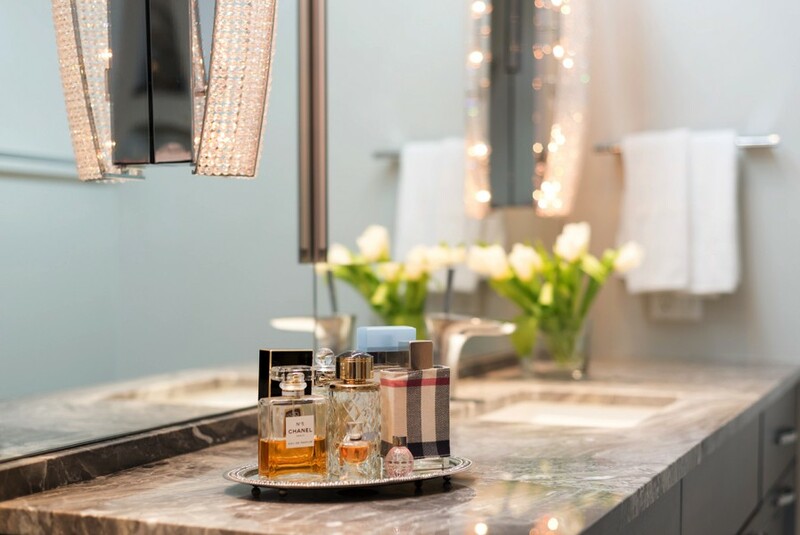 The existing bathroom was outdated and dark, lacking any natural light. The client wanted a larger shower with updated fixtures, more vanity space and storage, a soaking tub, heated floor, and a TV in their new bath. 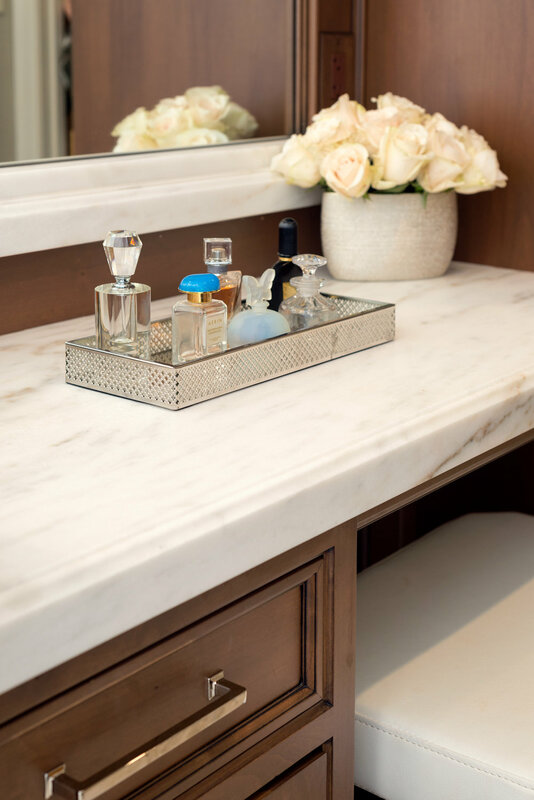 By opening up the existing walls within the space and adding transom windows above the new mirrored vanity wall we were able to achieve their dream bath design requests. The existing basement lacked entertaining space and flow to other areas of the home. The client wanted a social kitchen, temperature controlled wine room, seating groups, fireplaces, game areas, a secret door to access the storage room and a full bath in their new basement space. 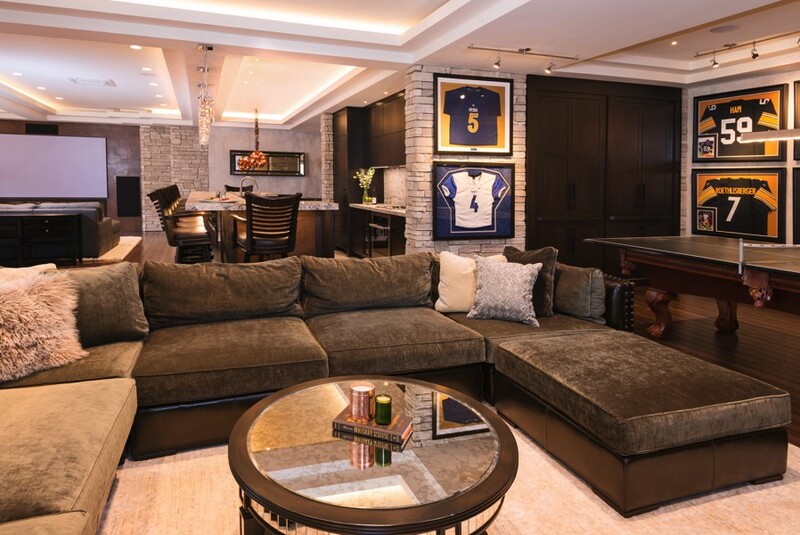 By reworking the existing space, using built-in custom cabinetry, and unique finishes we were able to achieve their dream basement remodel. The client wanted a space for their new bourbon bar that would be a unique venue for small plate service and drinks for their growing discerning clientele. By reworking an existing structure and incorporating both soft and hard seating groups, fireplaces, and unique finishes we were able to achieve their ideal restaurant space. The existing kitchen was outdated, lacking in storage, and without a transition space from their main hall. The client wanted a drop zone for keys, mail, and paperwork, an updated butler’s pantry, professional appliances and a larger island. 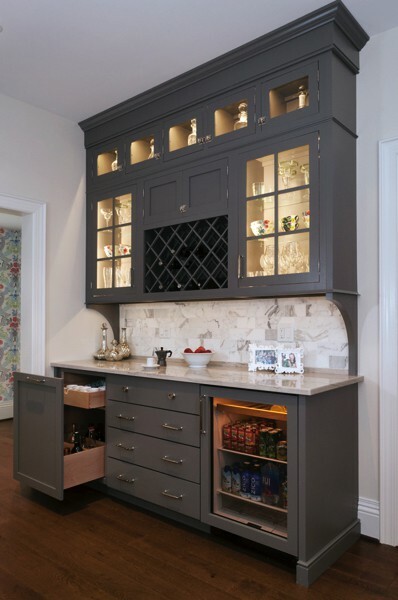 By reworking the existing space and recessing the refrigerator and pantry into an unused space, we were able to create the Beaux Arts kitchen she was dreaming of. 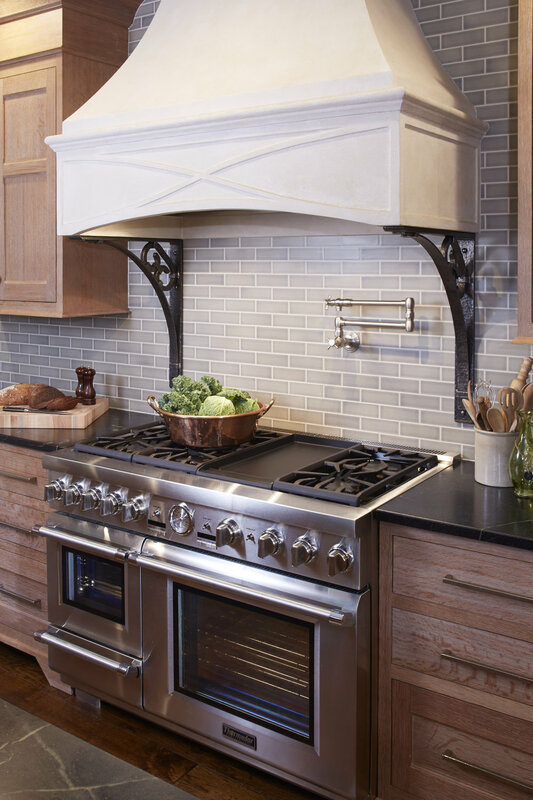 This Industrial Kitchen Project, located in the Shady Side area, was designed with best elements of industrial design in mind: wood, metals, and lots of textures. The design gives off an excellent raw appearance without compromising the stylish look of a classical kitchen. 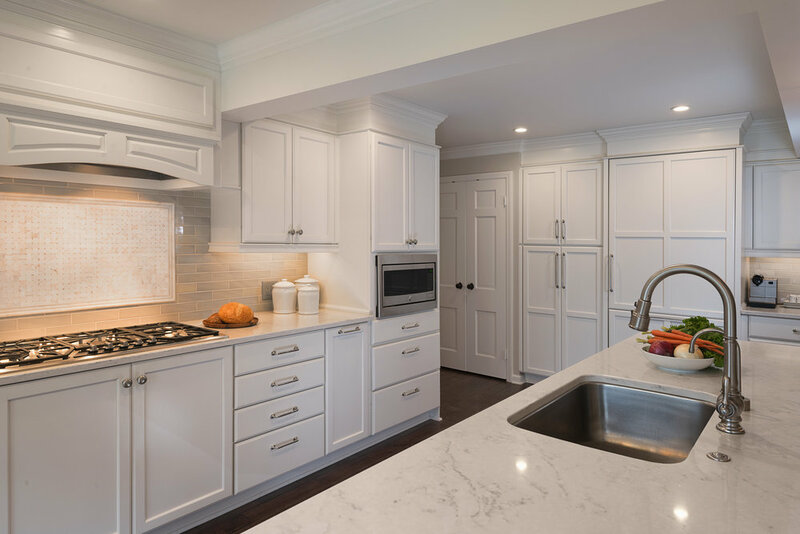 This beautiful transitional kitchen in the Fox Chapel area was designed to bridge the gap between a traditionally designed kitchen and a modern contemporary kitchen appearance. A kitchen of this nature is great for homeowners attempting to incorporate the perfect blend of elegance and sleekness. 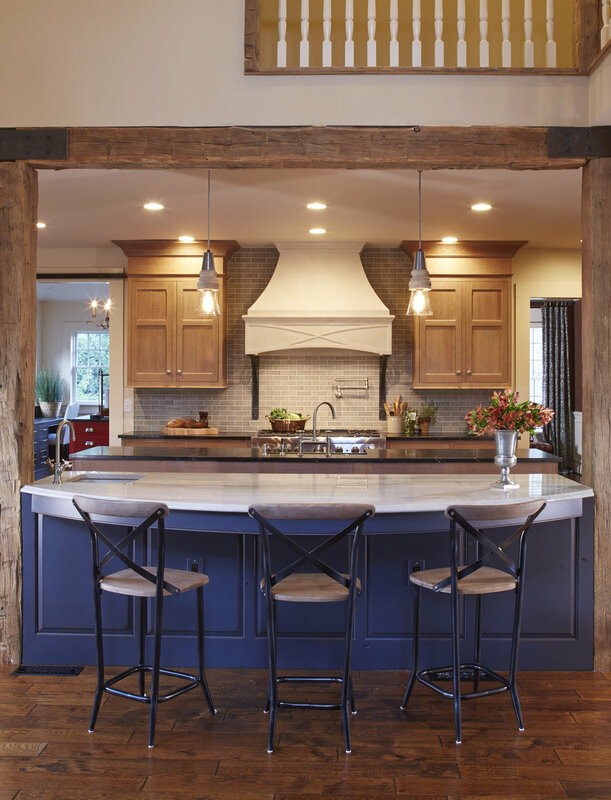 As a key part to this collaboration project, Evalia Design was tasked with creating a transitional kitchen design that had a modern flare to it. From the marble countertops to the custom shaker cabinetry, this kitchen turned out to be the epitome of modern elegance.